Vijayapur city, formerly Bijapur, is the district headquarters of Bijapur District of Karnataka state. It is also the headquarters for Bijapur Taluka. Bijapur city is well known for its historical monuments of architectural importance built during the rule of the Adil Shahi dynasty. Bijapur is located 530 km northwest of Bangalore and about 550 km inland from Mumbai, and 384 km west of the city of Hyderabad. Bijapur urban population as per 2011 census is 326,000, perhaps the 9th biggest city in Karnataka. Bijapur Mahanagara Palike(BMP) is the newest Municipal Corporation formed under the KMC act along with Shivamogga and Tumakuru Municipal Corporations. The other existing city corporations in Karnataka state in descending order of population are Bengaluru, Hubballi-Dharawada, Mysuru, Kalaburgi, Belagavi, Mangaluru, Davangere and Ballari. Administratively, Bijapur district comes under Belgaum division along with Bagalkote, Belgaum, Dharwad, Gadag, Haveri and Uttara Kannada (Karwar) districts. Bijapur, the land of five rivers and the domain of different cultures, is an ancient city. The city established in the 10th and 11th centuries by the Chalukyas of Kalyani was known as Vijayapur (City of victory). Bijapur was the biggest district place of the state with 11 taluks, but the partition of the district in 1997 made it to lose that title. Now it consists of five taluks viz. Basavan Bagevadi, Bijapur, Indi, Muddebihal and Sindagi. The city was established in the 10th-11th centuries by the Kalyani Chalukyas and was known as Vijayapura (City of victory). The city was passed to Yadavas after Chalukyas demise. The city came under the influence of the Khilji Sultanate in Delhi by the late 13th century. In 1347, the area was conquered by the Bahmani Sultanate of Gulbarga. By this time, the city was being referred as Bijapur. Bijapur, Karnataka. Ironically the name Beejpur literally means replete with seeds in Sanskrit, meaning Pomegranate. Beejpur is a hindi word and does not exists in sanskrit . In 1518, the Bahmani Sultanate split into five splinter states known as the Deccan sultanates, one of which was Bijapur, ruled by the kings of the Adil Shahi dynasty (1490–1686). The city of Vijayapura owes much of its greatness to Yusuf Adil Shah, the founder of the independent state of Bijapur. The rule of this dynasty ended in 1686, when Bijapur was conquered during the reign of Mughal emperor Aurangzeb. In 1724 the Nizam of Hyderabad established his independence in the Deccan, and included Bijapur within his dominions. In 1760, the Nizam suffered a defeat by the Marathas, and ceded the region of Bijapur to the Maratha Peshwa. After the 1818 defeat of the Peshwa by the British in the Third Anglo-Maratha War, Bijapur passed into the hands of the British East India Company, and was assigned to the princely state Satara. 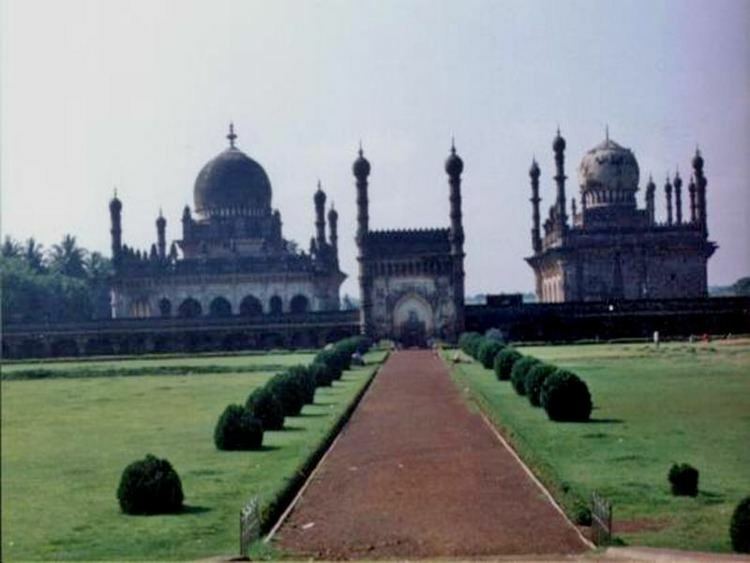 Bijapur came under Muslim influence, first under Allaudin Khilji, the Sultan of Delhi, towards the end of the 13th century, and then under the Bahamani kings of Bidar in 1347. In 1347, when the Bahamani dynasty was established, it included southern and eastern parts of Bijapur district. The supremacy of the Bahamans may be said to have ceased by 1489. At that time five Shahi Dynasties were born and one of them was „Bijapur?. The Mughal emperor Aurangajeb conquered Bijapur in 1686 and it was under Mughal rule up to 1723. 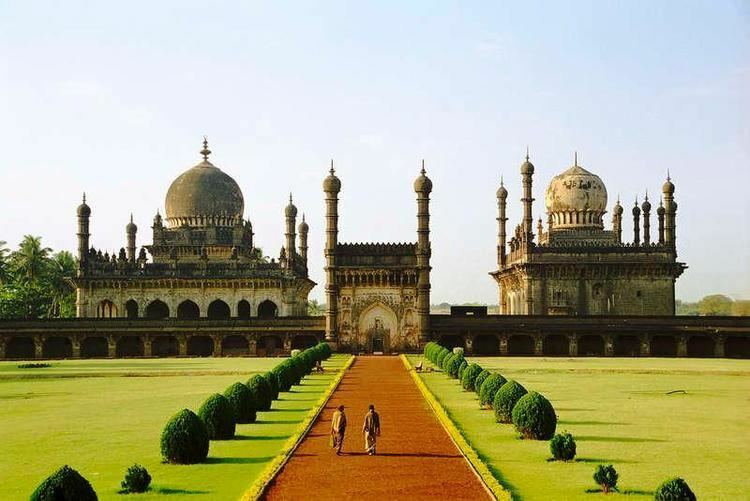 In 1724 the Nizam of Hyderabad established his independence in the Deccan and included Bijapur within his dominions. However, his acquisition on this portion was of brief duration, in 1760 it went into the hands of Marathas. In 1817, war broke out between the British and the Marathas. By 1818, the whole of Bijapur was occupied by the British and was included in the territory assigned to the Raja of Satara. In 1848 the territory of Satara was obtained through the failure of heir and the British rule started. Till 1884, the Bijapur district was known as „Kaladagi? district and the headquarters of the district was also at Kaladagi. (Now it is Bagalkot district). Bijapur was made headquarters in1885. After Independence, the movement for re-organisation of States gained further momentum and on 1 November 1956 a separate „Mysore State? was formed. By the wish of the people it was renamed as „Karnataka?. Thus, the district Bijapur along with other Kannada speaking areas became a part of „Karnataka State? on 1 November 1973. In 1848 the territory of Satara, along with Bijapur, was annexed to Britains Bombay Presidency when the last ruler died without a male heir. The British carved a new district by the name Kaladagi. The district included present-day Bijapur and Bagalkot districts. Bijapur was made the administrative headquarters of the district in 1885, when the headquarters were moved from Bagalkot. After Indias Independence in 1947, the district became part of Bombay state, and was reassigned to Mysore State, later Karnataka, in 1956.Center government have approved the request to rename the city in October 2014 and Bijapur is renamed (along with other 12 cities) to "Vijayapura" on November 1, 2014. This is the most famous monument in Bijapur. It is the tomb of Mohammed Adil Shah (ruled 1627-1657). It is the largest dome ever built in India, next in size only to St Peters Basilica in Rome. A particular attraction in this monument is the central chamber, where every sound is echoed seven times. Another attraction at the Gol Gumbaz is the Whispering Gallery, where even minute sounds can be heard clearly 37 metres away. Gol Gumbaz complex includes a mosque, a Naqqar Khana (a hall for the trumpeters) (Now it is used as museum) and the ruins of guest houses. It has several curious objects like inscriptions, sculptures, paintings, manuscripts, and weapons etc., displayed. It is near Gol Gumbaz and is run by the Archaeological Survey. This is the tomb of Ibrahim Adil Shah II (ruled 1580-1627), the fifth king of the dynasty and, like the Mughal emperor Akbar, known for religious tolerance. Built on a single rock bed, it is noted for the symmetry of its features. It is said that the design for the Ibrahim Rauza served as an inspiration for that of the famous Taj Mahal. In British India, a tower with a marble structure with a bust of King Edward VII and a park around the tower were established in memory of King Edward VII, Emperor of India. The memorial is situated in the heart of the city, and the foundation stone for the memorial was laid on 2 November 1913 by Lord Hardinge, Viceroy of British India. Built in the Indo-Islamic architecture, the memorial served as an attraction for children. The memorial once had beautiful fountains and taps providing drinking water. It was the equivalent of Bangalores Cubbon Park or Lalbagh for the residents of Bijapur. However, mismanagement by government in the 1970s resulted in the destruction of the park. There was a proposal to demolish the memorial, and establish a deer park, and then a Ranga Mandira. All these projects were not successful, and only resulted in destruction of the park. On the site of park, a godown, Kandagal Hanamantharaya Ranga Mandira, district Lokayukta office and Information?Department buildings have been constructed, and the memorial has been reduced to only a few feet. Today, there is no sign of the beautiful park, which once stood, and the neglected statue of King Edward VII stands testimony to the neglected heritage. The largest medieval cannon in the world. Being 4 m long, 1,5 m in diameter and weighing 55 tons, this gun was brought back from Ahmadnagar in the 17th century as a trophy of war by 400 oxen, 10 elephants and tens of men. It was placed on the Sherza Burj (Lion Gate) on a platform especially built for it. The cannons nozzle is fashioned into the shape of a lions head with open jaws & between the carved fangs is depicted an elephant being crushed to death. It is said that after igniting the cannon, the gunner would remain underwater in a tank of water on the platform to avoid the deafening explosion. The cannon remains cool even in strong sunlight and if tapped, tinkles like a bell. In 1854 the cannon was auctioned for Rs. 150 but the sale was cancelled in the end. Ali Adil Shah (1557–1580) built this tank near eastern boundary of Bijapur. When there was large influx of people into Bijapur after the fall of the Vijayanagar empire, and new settlements came up within the walled city raising the need for better infrastructure and providing water supply. This has a storage capacity of 20 million litres. Later it became a model for many other tanks constructed in the city. A grandeur complex came up around it, which was mainly used to house the maintenance staff though members of the royal family occasionally used it for recreation. He named this after his wife "Chand Bibi". The Asar Mahal was built by Mohammed Adil Shah in about 1646, which was used to serve as a Hall of Justice. The building was also used to house hairs from the Prophets beard. The rooms on the upper storey are decorated with frescoes and the front is graced with a square tank. Here women are not allowed inside. Every year there is urs (festival) held at this place. In front of the hall, one can see three tanks the bigger tank, which is at the centre is about 15 feet (4.6 m) deep however the other two are comparatively smaller in size as well as depth. Behind Asar Mahal one can still see the remain of the citadel. Just a kilometer away behind Asar Mahal, one can still find the old mosque which is on top of the citadel wall. There is a big entrance with arc below this mosque. Many stones have inscriptions. The site is under maintenance of Archeological Survey of India. Which means Sky Palace, is built with a 21- meter facade and four wooden massive pillars, has a majestic central arch. Sikandar Adil Shah, in silver chains, surrendered to Aurangzeb in 1681 here. A mausoleum of Ali Roza built in 1672. It was previously named as Ali Roza, but Shah Nawab Khan changed its name to Bara Kaman as this was the 12th monument during his reign. It has now seven arches and the tomb containing the graves of Ali, his queens and eleven other ladies possibly belonging to the Zenana of the queens. Meaning sixty graves, is a site which can aptly be called as the dark tourist spot. Saat Kabar may not have any intricate or wonderful architectural characteristics like the Gol Gumbaz or Ibrahim Roza to offer to its visitors, but the heart-rending story it narrates makes it a spot worth visiting. This heritage site tells the story of a passionate army chief who killed his 63 wives fearing they would remarry after his death. Afzal Khan, the army chief of Ali Adil Shah II of the Adil Shahi Dynasty that ruled Bijapur for four centuries, cold bloodedly murdered all his wives, one by one, before setting out on a battle with Chhatrapati Shivaji Maharaj, the great Maratha warrior, at Pratapgad in Maharashtra in 1659. Sick of continuous attacks by Aurangzeb on one side and Chhatrapati Shivaji Maharaj on the other side, Ali Adil Shahi-II ordered Afzal Khan to contain these two enemies to protect the empire. Although known for his bravery, Khan was a firm believer in astrology. He always consulted soothsayers before setting out on a war. When an astrologer predicted about his defeat and sure death in the battle against Chhatrapati Shivaji Maharaj, he decided to kill all his wives so that they would not remarry after his death. Hence he led all his wives to a huge well in a lonely place on the outskirts of the city and pushed them into it one after another. Later, he buried their bodies near the well. Seeing this horrifying act, two of his wives tried to escape, but in vain. They were chased and killed by soldiers, reveal historical records. It is situated on the western outskirts of the city. Ibrahim Rauza comprises two buildings, a magnificent tomb and a remarkable mosque enveloped by a garden. Facing each other, these twin buildings have a fountain in between them. A Persian inscription here records the construction of this Rauza in 1626. These buildings stand on a raised terrace supported by arches in a large rectangular enclosure with a high entrance tower in the centre of the north side, adorned with four graceful minarets. This is the most ornate building in Bijapur. Both the buildings have square plans with four minarets at the corners and a bulbous dome at the centre, which emerges from lotus petals. Cousins called the building as “The Taj Mahal of the Deccan”. Mosque is standing at the east of the Chini Mahal. The mosque appears to be a Hindu temple originally. An inscription inside the pillar in old Kannada characters dated 1320 A.D. says the name of the builder of the upper part as Ravayya of Salotgi. It is a rectangular enclosure with a fine vestibule in front, the portico of which spreading into wings fills the forepart of the mosque. According to another version, earlier it was a Hindu college, converted into a mosque. It is behind the Government High School. A pair of tombs is housed in this. The floors of both the tombs are at a very considerable elevation, as the graves have been built at floor level. Both the buildings have galleries within the domes. Afzal khan’s cenotaph is at a distance of about four km from the gate way of Shahapur. There is a mosque too. Afzal khan commenced the construction of his own splendid tomb in his lifetime. But he was not buried in the tomb. About one km towards south of Afzal khan’s tomb are his wives’ tombs on a masonry platform consisting of 11 rows of graves. There are 63 graves and one is empty. It is said that Afzal Khan believed in one astrologer’s prediction that he would never return to Bijapur when he went to meet Chhatrapati Shivaji Maharaj, and had all his 64 wives drowned before his journey, except one who escaped. That is how one grave is empty. It is a tomb at a little distance to the south of Ali I’s tomb. It is finely cut and molded in a dark greenish black-basalt, standing on a raised large platform. The name of the buried person is not known. 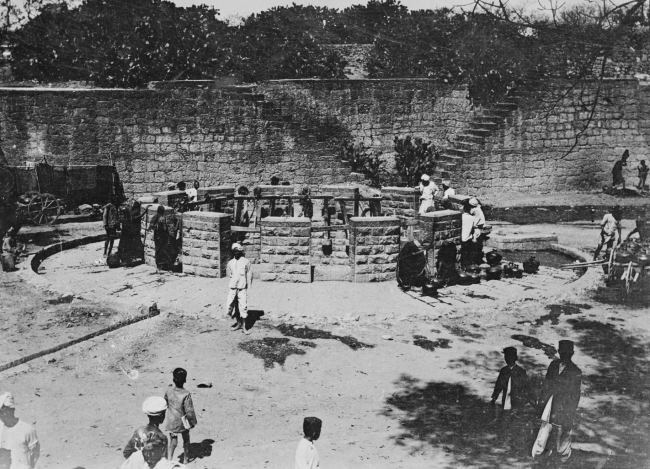 It is a small tidy square structure, to the north of the Sat-Manzil standing in the middle of a dry reservoir, which was exclusively meant as a pleasure spot for the royal family. Landa Kasab Gun Lies in the middle of the southern fort of the City. It weighs about 46.5 tons, and there is another small gun on the same bastion. Though unprotected for 300 years from the rig ours of climate, these guns show no signs of decay. 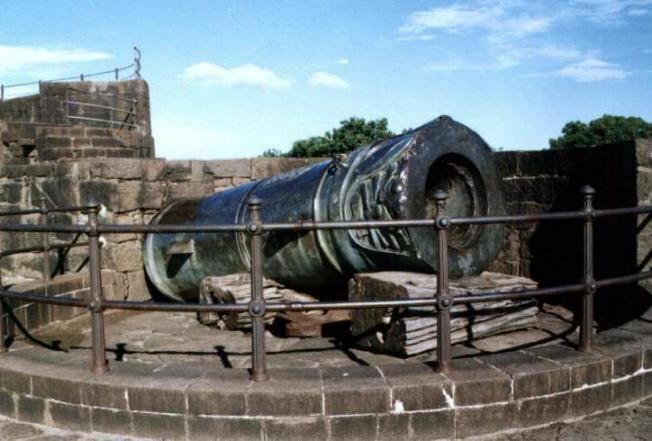 The great gun of Bijapur, is placed to the north of Phatka gate in a tower. This is the biggest gun in Bijapur, weighing about 55 tons and was cast at Ahmednagar in 1549 by a Turkish Officer in the service of Burhan Nizamshah and this information is engraved on it. The muzzle is fashioned into the form of the head of a lion or dragon. It is part of the mansion that now remains to the west of the citadel. In this dilapidated five-storeyed building are traces of painting, and stucco work has been executed on the ceiling of the different floors. To the west of the Mecca gateway, about 100 yards away is Taj Bavadi. The well is 223 feet (68 m) in square and 52 feet (16 m) deep. It has a lone tower called Upari Buraz situated on a high ground. It was built in 1584 A.D. and on it placed are two guns. It is stands about 100 yards west of the citadel, built by Ibrahim Adil Sha II in honour of his wife Mallika Jahan Begam. The columns of the arches are very fine and the stucco work is very good. It stands about 75 yards north of Bukhara Mosque. It is a peculiar combination of Hindu-Muslim architecture. The roof is borne not on arches but on eight-sided columns with Hindu pedestals and capitals. The construction is in Hindu style except the central dome and the western mihrab. It is situated near the middle of the citadel. It is one of the finest and smallest mosques here. It appears to belong to the period of Ibrahim II. It is located near the great Gol Gumbaz. It was founded by Saint Shanmukhaswami. A big front hall surrounded by an open yard has a cellar containing the Samadhi of Shanmukhaswami. About 3 km from the city near the dargah is a basadi of Parshwanath. The black stone idol is about 3 feet (0.91 m) high and of beautiful workmanship. A serpent with 1008 small hoods spread over the deity as umbrella is delicately carved. Some years back while digging a mound, the figure is stated to have been unearthed. Torvi is located merely 5 km from Bijapur.The Narasimha temple, which is built underground is very close to Adil Shahis Sangeeth mahal. Nearby this temple, another Hindu temple of Devi Lakshmi is located.The people of Bijapur have a trend to visit these temples every Saturday. Shree Siddeshwar Temple is located in heart of the city. It is on behalf of Solapur Shree Siddarameshwar of Basavs Saints (Sharanas). Basavan Bagewadi is birthplace of Lord Basavanna.Here beautiful Nandi Temple had constructed in 11th century. It is under management of Kudal Sangam Development Authority. Alamatti Dam is situated in NH -13 border of Bijapur-Bagalkot twin Districts of Karnatak State. It is a best tourist place in Bijapur District. In Bijapur district agriculture forms the important source of livelihood for the most of the people. The population of the district according to 2001 census is 18, 06,918 of which 7, 18,213 are workers and 10, 88,705 are non-workers.Of the former category, 5,03,755 persons (2, 17,056 cultivators + 2, 86,669 agricultural labourers) are engaged in agriculture, forming 70.1 percent of the total working population.